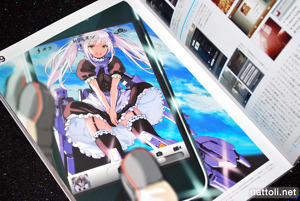 Moeru iPhone Reader is a B5-sized book, full color and 130 pages. The cover art work is by Nagi Ryou, and appears without the cover text though in a smaller size on the first page of the book. There is the usual mix of artists that these books tend to have, with famous artists along side new names. Pictured above are Nagi Ryou (x2), Kazuhara Kina, Midori Foo, Puaka, and Mota. 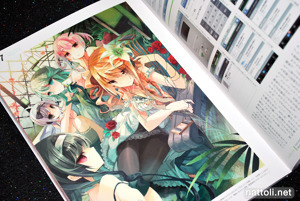 Other artists at the beginning of the book were Virus, Sody, Moso, Yuhi Alfa, Yukiu Con, and Yazzz. 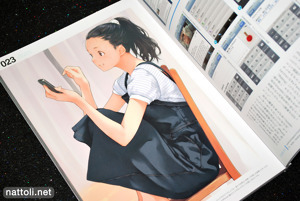 The layout is no doubt what you would expect from this kind of book by now; one page features the illustration with the other page focusing on the iPhone app with screen shots and information about it. As usual, I'm not in it for the information, so I can't judge that part of the book. The illustration above is by Quiqui. 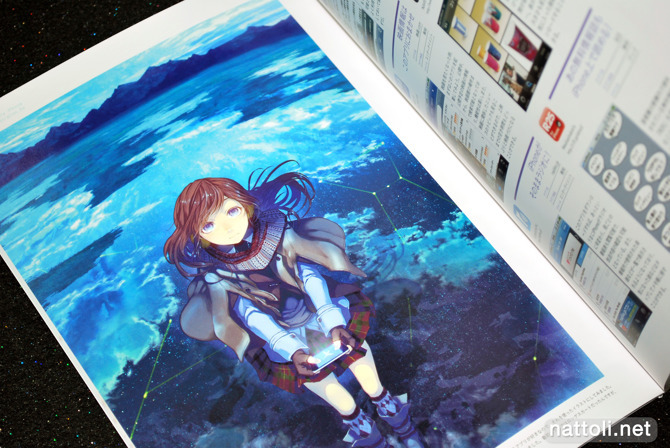 The illustrations above by Kamo, Izuru, Fuji Choko, and Saitom and were some of the better works in the book. 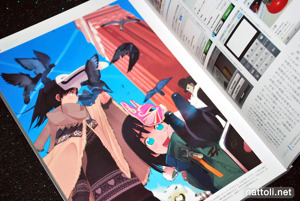 Izuru was new to me up until Quarterly Pixiv Vol. 02, where he received the illustration x art process treatment. 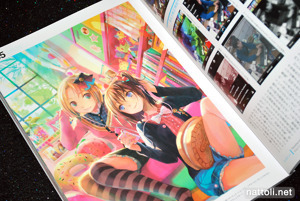 And Fuji Choko (along with several other artists) has really become a regular in these types of publications; aside from this book, she's also done illustrations for Moeru Classic Heroine Collection and Railway Girls and Scenery Pictorial Book. Yoshinori Shizuma and Jyuu Ayakura have also been making semi-regular appearances in these kind of books. 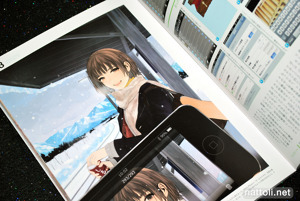 Yoshinori Shizuma's illustration actually had nothing to do with the corresponding app being reviewed, which makes me think some of the reviews may have changed at the last minute ^^; Duca's illustration shows off a lot of growth in just the past year, with a less angular and more refined style. I thought the inclusion of NIL's illustration was a bit odd, as he's an illustrator who is popular because he intentionally draws like redjuice. It's eyecatching, but I'm sure he can find his own style... Sime, Vania600 and Fruit Punch's illustrations were all as impressive as usual. Before I got an iPhone I always told myself it wasn't necessary and that it was just another over-hyped piece of ware that would be obsolete in 6mos. When I was up for a phone upgrade, I found myself eating my thoughts and stomping on my own pride. The 3GS was more in-line with what I wanted in function, style and price. True enough Apple's release of the iPhone 4 adds another notch to their belt, continuing on their style of driving consumer spending, I'll admit...they're quite good at it (though to be honest, the Droid series is better functionally and performance wise). I find it very interesting that a cellphone brand, let alone a single device, has created such distinct and unifying culture in its wake. It's truly a masterpiece of marketing but also technological ingenuity. The whole "there's an app for that" really opened up the stage for letting people with a little technical know-how create programs that thousands of people can use. 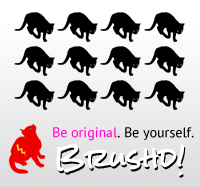 Speaking of which, Nattoli needs to have a serious app. I'd love to read this site on iPhone optimization. Maybe have a section where readers can snap shot art books and post initial impressions or illustrations where readers can help scavenger hunt. Just some thoughts for the future. Ah, right...the art book. I'll probably purchase this one since it's been a while since I last bought something. Is it because I have an iPhone? Probably...but I also like the illustrations and I want to get a better look at some of the apps they're advertising out. Heh, an app sounds like fun but I wouldn't even know where to start. I would like to hear more about others' art book finds, I know blogging about it feels like a commitment, but something briefer would probably feel doable for most people. This is just a weird fetish. As for it being a n iPhone reader book, well guess any excuse to assemble good artwork is good but wouldn't want them to make too many collections that the themes star to become silly.